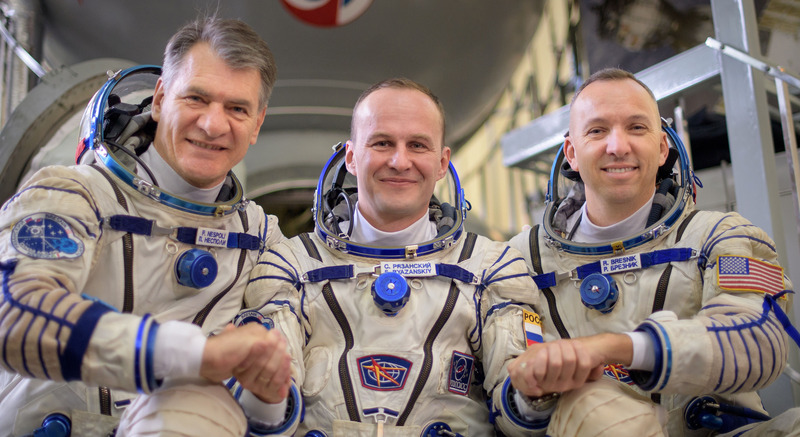 Expedition 52-53 crew members (from left) Paolo Nespoli of ESA, Sergey Ryazanskiy of Roscosmos, and Randy Bresnik of NASA are pictured in July 2017 at the Baikonur Cosmodrome in Kazakhstan before beginning their mission. Three crew members who have been living and working aboard the International Space Station are set for return to Earth on Thursday. Coverage of the farewell and hatch closure is now underway on NASA TV and the agency’s website. Hatch closure is scheduled for around 9 p.m. EST. Earlier Wednesday, Expedition 53 Commander Randy Bresnik of NASA handed over station command to Roscosmos’ Alexander Misurkin in an official Change of Command ceremony. Bresnik and Flight Engineers Paolo Nespoli of ESA (European Space Agency) and Sergey Ryazanskiy of Roscosmos will undock their Soyuz MS-05 spacecraft from the space station at 12:14 a.m. Thursday, with landing in Kazakhstan targeted for 3:38 a.m. (2:38 p.m. Kazakhstan time). Their return will conclude 139 days in space since their launch on July 28. Say what you will about the US and where it looks like it’s going; NASA has done a great job of inviting and including many nations in it’s programs. The ISS is the clear example of what a government can to to build valuable bridges between cultures, share important technologies and place the greater good of mankind ahead of all else. Safe journey back Exp 53, you’ll be in very good hands in the Soyuz vessel, probably the most dependable space technology still flying. Godspeed from Burlington, Vermont!